Supercharge Your Floor with Stadium Casino War! Increase player excitement with multiple betting opportunities and intense head-to-head play against the dealer with Stadium Casino War on the Fusion Hybrid! This exciting new game plays similar to traditional Casino War, however, this variation allows players to wager on up to seven betting locations at once, including an optional Tie bet. 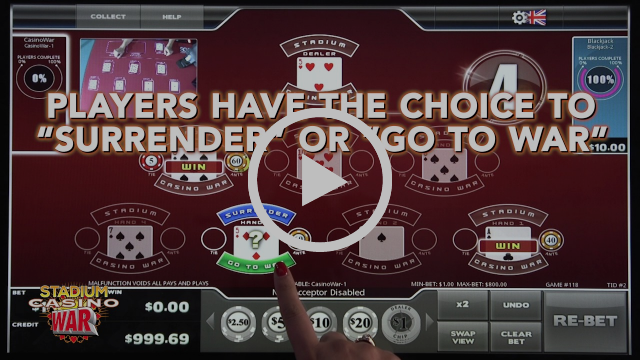 Additionally, operators have the option to deal three, five, or seven hands to participating players. Stadium Casino War requires the use of a podium and dedicated dealer, and promises to not only attract more players but also increase your profit potential! Visit our website or contact your Scientific Games Account Executive for more information. or pending patent applications listed at http://www.gamingipnotice.com/patents.